In my role as a professional editor, it still surprises me when I encounter authors who don’t see why they need a website at all. 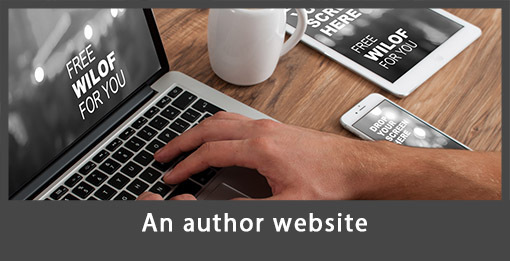 Some prefer a Facebook author page, and don’t get me wrong, they’re good too, but I believe a website is an essential tool in an author’s marketing strategy, especially if you’re only producing ebooks, not print books. The advantage of your own website over something like a Facebook page is that you can design it (or have someone design it for you) to your own specifications and you can fill it with whatever you believe will help promote your books. It can be a great way of creating your own ‘brand’, utilising any taglines you have for your books and any you may develop for yourself. You can also feature any images you may have discovered (or taken yourself) that promote your books, although make sure you have obtained them legally. The images should be ones you are allowed to use (ie: not copyrighted). It’s a good idea to have a clean page with clear links to your books, any other writing you do, your blog, and whatever else you want to feature. These should be displayed clearly at the top of the page or in a side bar, not just buried in long paragraphs of text on the page. Try to keep your paragraphs short and your writing succinct (much the same as in your books!). And it’s a good idea to use dark print on a light background, not the other way around. White print on a dark background can hurt people’s eyes and may put them off reading too far. I have a real problem with red writing on a dark background, which some people seem to favour, but my eyes can’t stand it, and I usually stop reading quickly. The most important benefit of having your own website is having somewhere you can direct people so they can easily find links to where they can buy your books. It’s essential to have pages where people only have to click on a link to be taken somewhere in order to buy your books. The easier this step is for them, the more likely they are to buy. But how do people find out about your website? There are many different ways to do that. You can produce a business card or bookmark with your website address and hand it out at any events you attend. You can share news about your website and new things you feature on it on your social media accounts. It’s also a good idea to have a blog that you update regularly. Whenever you’re putting up a new blog, make sure you share the link to it at other social media sites you visit, especially if it’s about a subject you think is of interest to the people there. For example, if you write books about the construction of boats, you might blog about the best ones you’ve seen and share the link on any boat sites or groups you visit regularly online. However, one note of caution—when sharing these links, make sure you don’t do it so often that you put people off. But more about that next week when I cover the importance of using social media. Are you an author? Have you seen any definite sales that have arisen through your website? Are you a reader? Do you like to visit author websites? Whose site is your favourite? Feel free to put links in your comments.